Eugene Laverty's disappointing season continued as he crashed out on the fifth lap of the Czech Republic MotoGP at the Brno circuit on Sunday. The Aspar Honda rider from Toomebridge has picked up just 12 points in his first season in the MotoGP class, with a best finish of 12th in Spain. Movistar Yamaha's Jorge Lorenzo won to draw level on points with team-mate Jorge Lorenzo at the top of the series. Spaniard Lorenzo leads the championship by virtue of having won more races. Lorenzo put in a masterclass of consistency for a start-to-finish win, taking the holeshot ahead of Marc Marquez and crossing the line with a 4.462 second margin to spare. Rossi was third, with Italian Andrea Iannone fourth on a Ducati and Honda-mounted Dani Pedrosa fifth. 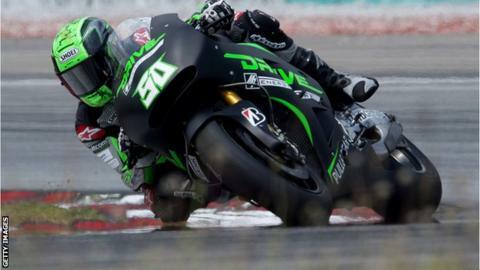 Laverty, 29, qualified in 20th place but escaped unhurt after being struck by Australian Jack Miller.